Coach Antonio Conte will miss Juventus's defence of their Italian title after the 10-month suspension he was handed following a match-fixing investigation was upheld. He was banned for not reporting alleged match-fixing in two games involving ex-club Siena in the 2010-11 season. He has now been acquitted over the Novara game, but the 10-month ban remains for the Albinoleffe match. 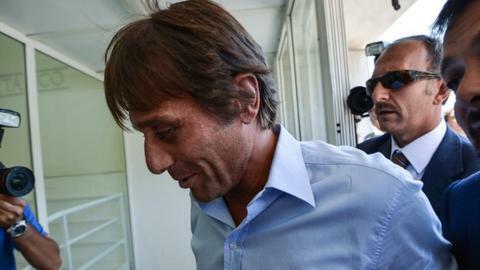 Conte is expected to launch a second appeal, to be heard in September. In addition to Juventus and Siena, has also managed Arezzo, Bari and Atalanta. Last season the 43-year-old former Italy international led unbeaten Juventus to the Serie A title in his first season in charge. Juventus, who will begin the defence of their league title against Parma on 25 August with technical director Massimo Carrera in charge, have said they will stand by Conte. Conte's assistant at Siena and Juventus, Angelo Alessio, has had his original eight month ban reduced to six months on appeal. The tribunal also confirmed that Juventus players Leonardo Bonucci and Simone Pepe have been cleared. Marco Di Vaio and Daniele Portanova had each been suspended for six months for their alleged failure to report match-fixing in the Bologna v Bari match of May 2011, but former Italy international Di Vaio has been acquitted. Lecce's demotion to the Lega Pro - the third tier of Italian football - was confirmed, but the decision to hand Grosetto the same fate has been overturned. The three-year suspension of former Siena defender Emanuele Pesoli, who chained himself to the gates of the Italian Football Federation (FIGC) for four days in protest at the call, was upheld. The FIGC's disciplinary tribunal has been investigating 13 clubs - mainly from the second division - in the latest match-fixing scandal to hit Italian football. The investigation comes six years after a similar scandal deprived Juventus of two titles.